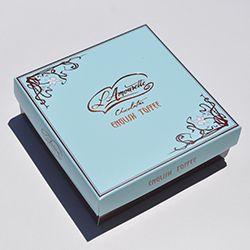 Signature Dark L’Amourette Chocolate 72% Carenero Superior – Venezuelan Beans (Cocoa Beans,Cocoa Butter, Cane Sugar, Bourbon Vanilla Beans), Butter (Milk), Cane Sugar, Californian Salted Almonds, Natural Vanilla Paste, Sea Salt. Soy-free product. All natural ingredients. Received as a gift and found the toffee to be absolutely delicious!